Taking care of a business is tough. There are so many things to keep in order to ensure the success of your company and cleaning is one of the most important. While cleaning the office is common, one area that is often overlooked is window cleaning – and it’s more important than you think. Keeping your windows clean, especially if you rely on your storefront to draw in customers, is vital. Dirty and dingy windows will reflect poorly on your business, no matter how good of service you offer. You only get one chance to make a good first impression on your customers, and professionally cleaned windows will help your business do this. If you have dirty windows during the winter, summer or are in the midst of spring cleaning, let us do this tedious task and make it worry free for you. From house to low rise buildings, we have cleaned them all. 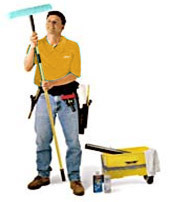 We have the proper cleaning supplies tools and team to get the job done right – with no streaks! Forget about trying to do it yourself or having your employees do an okay job. If you want professional results, you need to hire professional window cleaners. Our pledge is to provide superior service to each of our customers. We guarantee 100% satisfaction. Clean windows will improve the image of your building and can make a huge difference in the living atmosphere that your or office or condominium is having. We are also more than willing to work around your busy schedule to ensure you can get your windows cleaned at a time that makes sense for your business. To learn more about our commercial window cleaning services and how we can help you, give us a call at 1-888-558-4867 and we will visit your property for a free on-site estimate!